If I receive an exempt worker's comp recovery after filing chapter 13, is it safe from my creditors? After I file bankruptcy, is it safe to cash in my IRA that I have claimed exempt under Texas law? 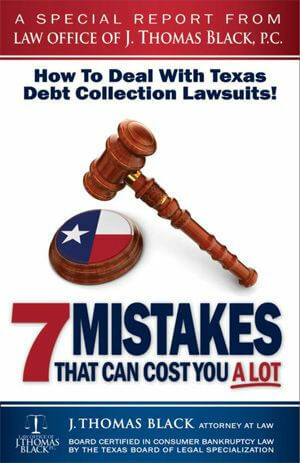 Can I be sued in Texas for a consumer debt like a credit card in a county where I don't live? Is it an FDCPA violation for a debt buyer to file a proof of claim for a time-barred debt in a bankruptcy case? 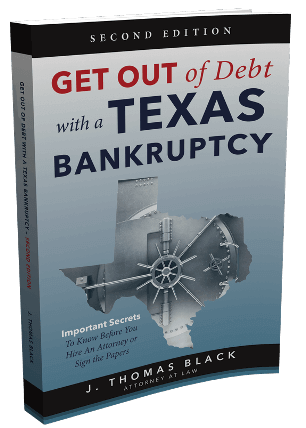 Should I wait to file my bankruptcy in Houston, Texas? I had to leave the military early, now they are trying to get my reenlistment bonus back from me. Can I discharge that debt in bankruptcy? Can I file a joint bankruptcy case with my common-law spouse and just pay one bankruptcy lawyer fee and one filing fee? I owe the IRS a lot of money! Do they charge me a fee to enter into a payment plan with them? If I transfer property to a friend or relative to keep it out of bankruptcy, how long do I have to wait so it is safe from seizure? I'm in chapter 13. My mortgage company filed a notice for fees incurred more than 180 days before they filed the notice. Are they allowed to do that? I'm a contractor and when I could not complete a project, I got sued under Texas Construction Trust Fund Act. Are there any defenses? Can my Texas car or truck registration be denied if I owe delinquent child support? Can I complain to the Department of Education if a federal student loan debt collector is harassing me or lying to me? Can a bankruptcy trustee take my I.R.A. money if I take a lump sum out during my bankruptcy? I am in chapter 13 and Wells Fargo is my mortgage company. Will I receive a payment from a settlement? Can I get rid of I.R.S. Income taxes if I file bankruptcy? Can I file chapter 13 bankruptcy just to stall foreclosure? Can my homeowner association foreclose on my Texas home for unpaid HOA dues? If I'm evicted from my home after a Texas foreclosure, what happens to my personal property? Can the I.R.S. seize and sell my homestead to pay my delinquent taxes, even here in Texas? 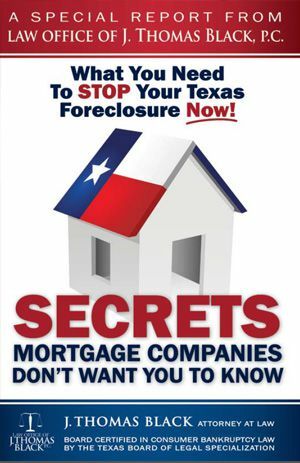 ?I heard that Texas foreclosures had to be held on the 1st Tuesday of the month that the sales are held in. What about if that falls on January 1 or July 4? ?Can I save my small business by filing chapter 11 bankruptcy? ?Can I trust my mortgage company if their representative tells me that the foreclosure of my home is stopped?